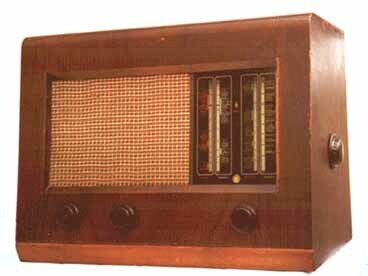 This was my father first radio. I was born with it in 1950 . This radio was bought in Mozambique were I was born to. It worked always in good conditions . Only a fine tune was needed in recent time. This radio tells me very much about the old time radio. The first ham radio I listen to in 80 and 40 meters in AM was with this fellow. Later I made a 455Kc oscillator and put near it to listen the SSB. Later in 1970 I got the ham radio licence CT4BB in Portugal. Valves : CY31( Rectifier) ; CCH35 ( mixer ) ; EF39 ( if amp ) ; EBC33 ( if ampl + rectifier) ; CL33 (output ).